FAQ: Where can I find streaming video and DVDs? You can find a list of all the databases where you can find streaming videos or video clips (and images) on this page. Look for databases with the icon next to their name, which indicates that the resource contains streaming videos or video clips (you can also look for databases with this icon on our A - Z Database List to find streaming video and video clips in databases). You can also search the Online Library Catalog for streaming videos. 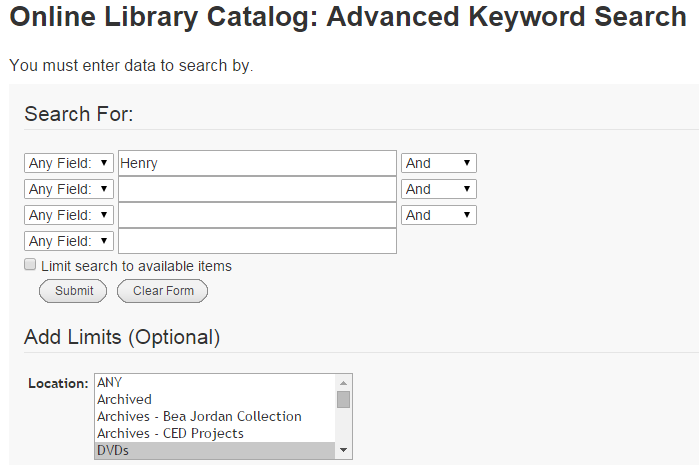 In the search box(s), enter the title, subject or keyword(s) and then click "Submit".